The International Hot Rod Association (IHRA) is proud to announce that a trio of award winning companies will build power and beautify the Top ET National Championship grand prize again this season in the Summit SuperrSeries. The 2016 Summit SuperSeries Top ET National Champion will not only have beaten the best racers in the country during the Summit World Finals in Memphis, but he or she will leave the property that weekend with one of the most impressive turn-key dragsters in the country courtesy of American Race Cars, Trick Flow Specialties and Imagine That Customs. American Race Cars founder and 1999 IHRA Super Rod World Champion Mark Horton will again lead the team that creates the industry leading Patriot series chassis from the Millbury, Ohio facility. Co-owner and 2015 IHRA Quick Rod and Top Dragster D3 Champion Travis Colangelo will be leading the fabrication team and oversee much of the main assembly duties. The two have combined their years of experience to develop a revolutionary new swing-arm uni-shock design four-link dragster that is easily adjusted to work with a 1,200 horsepower Big-Chief 632 and a conventional headed 540 cid engine. Since its inception in late 2004, American Race Cars has quickly become one of the premier chassis builders in sportsman racing. Several championship drivers and teams have made American Race Cars their weapon of choice for competition in Quick Rod, Top Dragster, and bracket categories. Joining Horton and Colangelo behind the wheel of American machines are championship caliber drivers including: Sherman Adcock, Jr., Luke Bogacki, Dave Connolly, Dave & Jacob Elrod, Mike Fuqua, Steve Furr, Cameron Manuel, Donny Urban, Danny Waters, Jr., Rob Moser and a host of the sport’s elite class and bracket racers. “Our team loves this project because we are all sportsman racers here at American Race Cars and this is our way of supporting all the men and women that race each and every weekend at their local IHRA track,” said Horton. “Travis and I are proud to build this car for the Summit SuperSeries National Champion and we just want all the 2016 Summit SuperSeries competitors to know that we plan on raising the bar again this year for the build." Trick Flow PowerPort® 365 cylinder heads are the featured component on this 572 build due to the fact that they deliver exceptional power potential and competition level durability. Features include rectangular intake runners for strong mid- to high-rpm performance, fully CNC-profiled, heart-shaped combustion chambers, CNC bowl blended valve seat transitions, 24 degree intake valve angles with four degree side cants for additional airflow volume, adjustable guideplates, and premium quality, high-strength aluminum castings. The heads include top-of-the-line CNC Competition Ported runners with a high resolution finish for maximum airflow and power and are assembled with the highest quality valvetrain components for ultimate endurance in all operating conditions. “The best part of the Trick Flow engine build is that all the components used in the build are available to everyone from Summit Racing Equipment’s huge online and catalog selection,” said Downs. 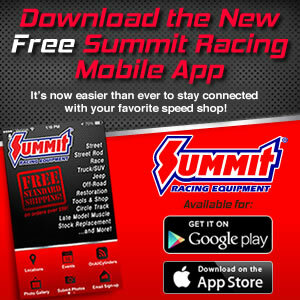 “You can build the same engine that will power the 2016 National Champion for your own racing program with one click or call to Summit Racing Equipment. I think for this program it is extremely important that we show you how to make over 1,000 horsepower right out of the Summit catalog. My guys in the shop want to beat last year’s record of 1,071 horsepower, so we are going to be working hard on the tune up this time around”. (L to R) Jim Greenleaf & Don Lower-Summit; Mike Downs-Trick Flow; Jerron Settles-Imagine That Customs and Travis Colangelo-American Race Cars with the 2015 National Championship dragsters. Rounding out the craftsmen that will produce the Summit SuperSeries National Championship dragster is none other than renowned painter and owner of Imagine That Customs, Jerron Settles. Jerron has been laying his multi-colored magic to the Summit SuperSeries dragster for several years and each year Jerron puts pressure on himself to create something better than the previous year. “I spend a lot of time pushing myself on these designs and on the incredible amount of detail because as a sportsman racer myself, I want to support the IHRA Summit SuperSeries racers as best I can and I want them to be proud of their accomplishments and this car,” said Settles. “This project is probably the toughest thing I do all season as I paint so many parts and components for this particular car and all the pieces have to work together with the overall design. It would be easy to design the car and paint matching valve covers, but we go through the car top to bottom and paint every part we can that lends itself to completing the custom design. When this car is uncovered at the Summit World Finals and the racers all collectively gasp, then I will relax and know that we’ve done a good job”. In addition to the primary sponsors of this build, a host of industry leading manufacturers will be supplying their parts and components to the 2016 Summit SuperSeries National Championship dragster build. Those companies and products will be announced in the coming weeks as the build progresses. The complete Summit SuperSeries entry requirements, race format and additional information can be found here: http://www.ihra.com/superseries-home. For more information about the IHRA, visit www.ihra.com, or call 419-663-6666 or connect with us on Facebook/ihramotorsports, twitter @ihra or instagram @ihradrs.